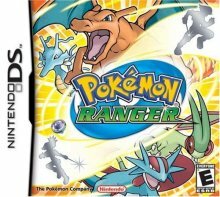 Pokémon Ranger is an action RPG for the Nintendo DS. In this game you start out as a rookie Pokémon Ranger and must travel the land helping out people & Pokémon eventually becoming a better Pokémon Ranger. Like in Mysterious Dungeon, the more missions you do, the higher your rank goes. Obtaining Pokémon is also completely different, instead of battling them, you take temporary control of them with a Capture Styler. Once obtained, you are capable of using them to help out once. Only 210 of the known Pokémon are obtainable in this game, however event given missions allow for several more Pokémon including new addition Manaphy to be obtained or even seen! Episode 432: Pokémon Ranger Appears! A Celebi Rescue Operation! Episode 448: Pokémon Ranger! Deoxys Crisis! Movie 09: Pokémon Ranger & The Prince of the Sea - Manaphy!